Only 30' x 40'; this compact town garden is crammed full of different features including walled and seaside gardens, 2 ponds and waterfalls, a man made stream, several water features, four sitting areas including a gazebo and a French Bistro. 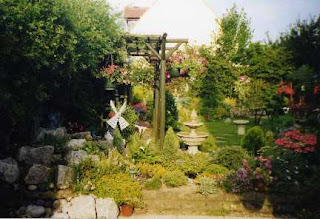 All lovingly created over the last seven years by two amater gardeners and showing the huge potential of a small garden. Limited parking in local road. Admission £2. Open 2pm - 6pm. Tell you what, there are some beautiful gardens in Barkingside. One of my favourite is on Craven Gardens - can't remember the name but it's so well-kept (though not pedantic) and bursting with colour. I think I know the one you mean. But not everyone has space at the front, which is why this particular resident, without success, has been trying to get Redbridge Council to have a Redbridge in Bloom Competition for rear gardens, like other London Boroughs. A competition for Blooming Rears? May I suggest it's called 'Do I Look Big In This'? 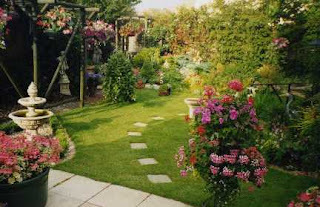 As good a place as anywhere to place my comment - feel free to put it elsewhere - it does cover the Thinking of Redbridge Council and like this garden - does show the route to abundant possibilities. Oh! So much better than – “You Only Have Two Minutes to put your question and the Cabinet Member also has Two Minutes.” – In which short time span little can be achieved, and probably less can be understood by all present? While at the same time; at Redbridge Council, Political banter and argument can dominate the time of the Meeting? I await the day when reasoned debate and/or argument prevails here in Redbridge. Where polite reference is given to a Member, but that Member’s contribution is more easily cast aside than recognized as having value. The Party line is, like a tape at the scene of a crime – placed between two lampposts and attached to a fence or vehicle, but once the officers of control are dispersed, and the tape is left remaining for some lesser officer or civilian to remove – it is often snapped by others who realize that the incident is over. Thus the Party line is left dangling, or at best, left fluttering in the wind, the pram wheel or across someone’s garden. On my return back to Redbridge I was confronted by an article in the Local Guardian Newssheet attributed to the Deputy Leader of Redbridge Council – regrettably, that article came across as a snub to all residents, but in particular to all who had contributed something towards the Redbridge Conversation or had expressed an opinion on the several shortcomings that were within its walls of ‘speciality’. I therefore, offer, and hope that this following piece may indicate a more humane manner in which to conduct and exercise such an exercise. I appreciate that this series may have TV-syndrome quirks, but it will, I trust be more user friendly than the aforesaid Redbridge Conversation, or even the previous Ilford Town Plan. The latter of which, to my mind, is little more than a collection of concrete and glass buildings and paved walkways, an account that will have shortcomings as blatantly noticed when Clements Road was being ‘Tableized’ recently, causing walking distances to become, at least tiring, if not exhausting for the less able. “An urban renewal initiative set on improving the town of Castleford, West Yorkshire, is the subject of a major new series beginning in August: Kevin McCloud and the Big Town Plan. The last five years have seen a series of different projects across the town, including the design of a new town square, the creation of several new facilities for local children and the design and build of a major new footbridge. What's unusual about the project is that it was founded by Channel 4 Television, local community and civic groups and Wakefield Metropolitan District Council. Thousands of local people were involved in setting the project's agenda, and the design and the delivery of individual schemes. Important new work was commissioned from national and international designers and artists. And the initiative has been credited with leveraging over £200m of additional new investment in to the town. Because of the innovative way in which it was designed, its extensive involvement of local people and its success in creating a clear, unified platform for the economic development of the town, Kevin McCloud and the Big Town Plan has won extensive praise for its best practice in urban regeneration. The project has also attracted international interest and praise. Progress so far has been discussed and highlighted at events in China the United States, Russia and Europe. People in Castleford are unusually committed to making it a better place. The town is easy to get to from elsewhere in the country, close to both Wakefield and Leeds and in the years before this project, had benefited from substantial new investment in housing, retailing and leisure. But people in Castleford wanted certain things to change. They wanted a more vital and vibrant town centre and derelict land put to better use. They wanted to sit by the rivers Calder and Aire and enjoy the view. They wanted more people to know about the town and its heritage. They wanted safe neighbourhoods, better health and the skills and confidence to move forward. Countless communities across the UK share their concerns. There are also many successful projects and programmes in Castleford to address them, especially in health, employment and social care. Castleford was chosen for this project because of the quality of that work, the unusual pride people in Cas have for their town and their unrivalled commitment to its future.